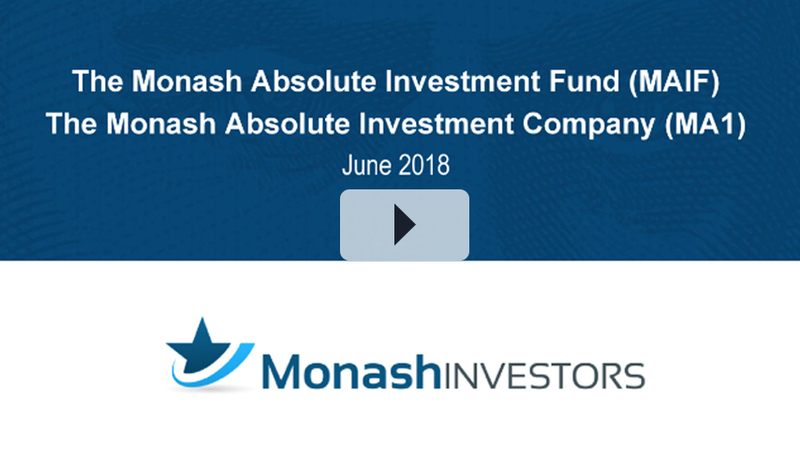 Monash Investors is an absolute return manager focused on Australian equities. I founded Monash together with Shane Fitzgerald in 2012, bringing over 50 years’ worth of combined experience. We believe in delivering the best possible returns at low risk. With 23 positions, we’ve delivered 9.6% returns net of fees per annum (since inception). On the back of this, we’ve maintained lower volatility than the market, and less exposure to sectors over-represented on the ASX. Across our portfolio, we currently hold no banks, telcos, or major resources. In our Fund In Focus below, I walk through how we select our investments, and discuss two current investments; a retail stock with 60% upside, and a media stock we’re short today. Monash Investors Limited aims to achieve their objectives by investing in a small number of compelling stocks that offer considerable upside, and by shorting expensive stocks that are at risk of falling. For further insights, see it here. That was an excellent presentation and I really like what you do. I was looking into buying the LIC but I think the performance fee over the RBA rate is terrible. I'm pretty sure someone of my limited skills could outperform the RBA with exactly 0% risk. ....and they have charged those performance fees notwithstanding the LIC share price is still 20 per cent under the listing price. Benjamin, it should be noted Monash are an absolute return manager. An absolute return fund seeks to achieve a positive performance in all market conditions. It is usual practice for those funds to choose an absolute benchmark such as the RBA cash rate. Performance fees are a rort but if you have to have them make sure they net out all under-performance. Or make them applicable only when the fund really does out-perform (top decile in comparison to other funds, market benchmarks etc). Like trailing commissions the world is moving on from these unnecessary fees grabs. Hi Joshua. I found some another LIC who do that - WMK. Although ALF don't. I've also seen the RBA rate been used as the floor return, such as MGG, so they don't get rewarded if they lose money in falling markets. If its a common practice then its rubbish and just a tax on investors who don't read the details. I won't invest in a fund manager who doesn't get a performance fee but the hurdle has to be genuine.